So you want to have a candy buffet for your next event? Great choice! Candy buffets are not only very visually appealing, but they also give your guests a place to mingle and snack, as well as give them a treat to take home. But what should you know before buying your candy in bulk? Measure. There is a science to it! Experts say you should plan for about a half pound of candy per guest. The more guests you have, the more unwrapped candy in bulk you should buy. And for individually wrapped candies, plan for one full sized bar per guest. Mix It Up. Depending on how many guests, you should have a variety of types of candy. When planning for under 80 guests, try about four to five types. For a head count over 80 plan for about seven to eight types of candy. Remember, you can also add other sweets, like cookies, macarons, and cupcakes to your candy bar, which can cut down on the types of sweets you have to get. Visual Appeal. Mix up the type of containers you use to display your candies. Choose from apothecary jars, bowls, platters, and tiered trays to hold treats. Just make sure guests can easily access them. Regardless of what kind of candies you choose, by taking the time to plan your buffet, you can create one that is visually appealing and appetizing! 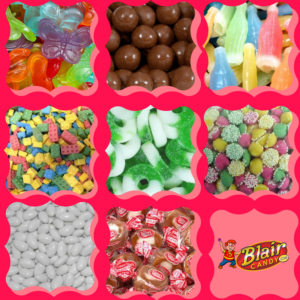 Find candy in bulk of all, shapes, sizes, and flavors at BlairCandy.com. You’ll find cool candies to go with your display in no time! Big League Chew: Can you really have a concession stand without Big League Chew? Grab this bulk pack that’s ready to display and packed with a few flavors. Tootsie Pops: Make sure a classic is on your stand with this bulk pack of Tootsie Pops. All of the flavors you love are there and ready to go! Cotton Candy: Get a snack that everyone will love. These bags of cotton candy will go in a flash. 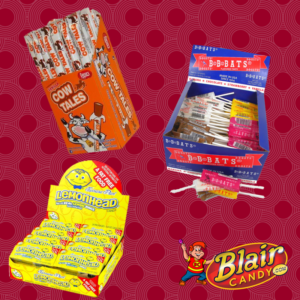 Get All of Your Favorites with Wholesale Retro Candy! BB Bats: With four different flavors, you’ll have a hard time choosing just one. There will be plenty of vanilla, chocolate, banana, and strawberry taffy lollipops in this box! Cow Tales: Who hasn’t had one of these? You can get a big box of the classic vanilla flavor, or try one of the other flavors. You’ll have 36 large cow tales to enjoy! Lemonheads: Every one of these candies is made with real lemon juice! If you love tart candies, you’ll love these delicious little candies. So what are you waiting for? Find all of your favorites and even some new ones when you visit our nostalgic candy page. Shop today and see if you qualify for a wholesale retro candy order! Candy Bouquets: These fun gifts can be customized with your recipient’s favorite candy or with a mixture. All you need is skewers, ribbon, a vase or flower pot, floral foam, and a glue gun. Gift Baskets: Mix sweet treats with salty snacks for a gift basket they’ll love. You can go with a theme, such as movie or sports snacks in a decorative basket. Care Packages: This is a simple way to say thank you. Wrap up your recipient’s favorite foods in a lovely box and top off with a handwritten note. Bonus points if your child adds a note of their own. 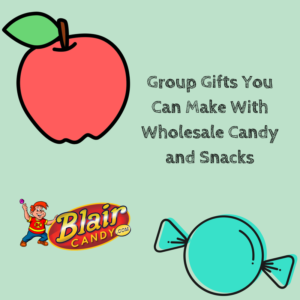 For all of your wholesale candy and snacks, be sure to shop at BlairCandy.com! There you’ll find new treats, classic favorites, and even retro candies. Shop today to get started on your end of year gifts. Stop that Cough with our Selection of Cough Drops! If you like honey when you’re sick, you’ll love these cough drops. These Honees cough drops have liquid honey in every drop! Vicks is a common name when it comes to cold relief. So it’s pretty natural for them to make a cough drop. Choose from menthol or cherry flavors to stop that cough. Want a selection of flavors? Luden’s cough drops has four flavors to choose from. We have Cherry, Honey/Licorice, Menthol, and Honey/Lemon ready for you! Shop these and other cough drop choices at BlairCandy.com. 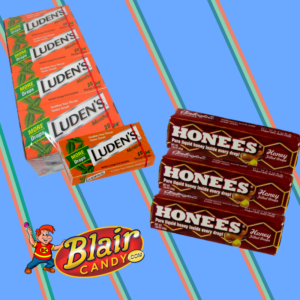 You can stock up on all of your go-to brands, including Luden’s cough drops, before a cold strikes! We love looking through blogs to find the next best recipe. Luckily enough, we’ve found quite a few recipes to share! This time though, we decided to look for recipes using everyone’s favorite peanut butter candy. 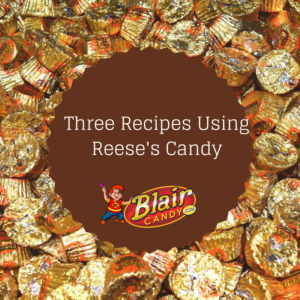 Here are a few recipes we’re ready to try using Reese’s Candy! Stuffed cookies are always a treat, but this one is especially awesome. Try this recipe from Sally’s Baking Addiction for a peanut butter frenzy! Cheese balls at a party are pretty common, but you should really switch things up with this dessert cookie dough “cheese ball” plate. What’s best is it’s topped with Reese’s Pieces. See how to make this recipe from”What’s Cooking, Love?” before your next party! Combine both Reese’s Peanut Butter Cups and Reese’s Pieces for the ultimate cake bar. See how to make this decadent dessert from Inside BruCrew Life here. What recipe are you looking forward to trying? Just remember you can get all of your baking candy needs, like Reese’s candy, at BlairCandy.com. Did You Know About these Sugar Free Candy Brands? All of the taste without the sugar? Sign us up! 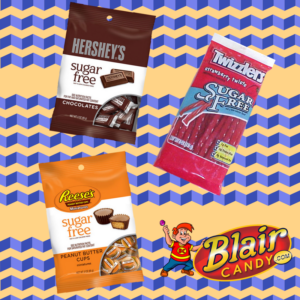 Blair Candy has a huge selection of sugar free candy, but did you know that these famous brands make sugar free versions of their favorites? Hershey makes sugar free chocolate in miniature sizes. Try either their classic or mildly sweet chocolate. They also make sugar free chocolate chips! Who doesn’t love a Reese’s Cup? Get that chocolaty, peanut butter taste you love minus the sugar with their mini, individually wrapped cups. Twizzlers are a standard movie candy, so make sure you have this sugar free version before your next movie night. 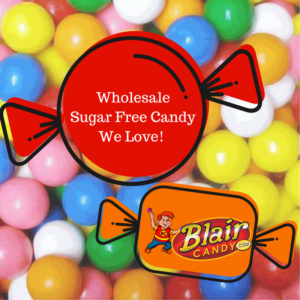 No matter what you’re craving, Blair Candy has a sugar substitute to satisfy it! Shop a variety of sugar free candy from your favorite brands today. Remember, you can order most in a single package or stock up with a bulk size! We all have that one person who is hard to shop for. When their birthday or a holiday comes around, we usually have no clue what to get them. Well, everyone loves candy! 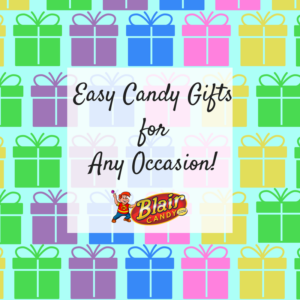 Blair Candy has a few different things you can even give your most difficult recipient. A Jelly Belly Jar. If your recipient loves jelly beans, this jar is perfect. They’ll love eating the beans as much as they will displaying them. Nostalgic Candy Can. Send a huge can filled with retro candy! Recipients will love remembering their favorites or discovering new ones. There are plenty of other gifts to choose from! 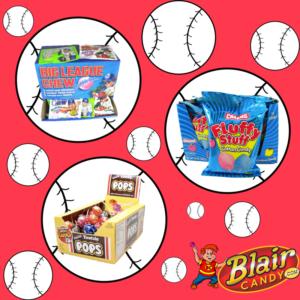 Shop Blair Candy today to find more sports themed, snack food, and retro candy gifts that anyone will love to receive. 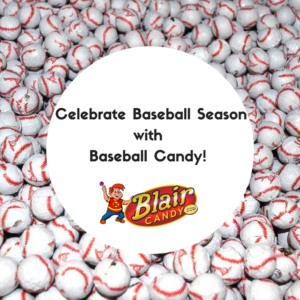 Celebrate Baseball Season with Baseball Candy! An absolute classic! A few pieces go a long way, but make sure you have enough. You might be asked for a piece or two. Make sure you have cooler weather for this one. This fun take on a simple candy will make anyone smile. What else did you expect? You really can’t have baseball without bubble gum, and this kind was specifically made for the sport! If you aren’t a fan of any of these, try some of the other treats in our baseball candy inventory. We have plenty for the ballpark or for when you’re watching the game from home. Shop now at BlairCandy.com and get to the game!